Network-attached storage has evolved to such an extent that today's servers can be thought of as the swiss army knife of computing devices. Be it centralised storage, media transcoding, company-wide backups or IP-cam surveillance, most modern NAS solutions are versatile enough to tick all these boxes and more. They are, in short, a useful addition to any home or office. Yet the NAS marketplace is mighty competitive, with numerous high-profile players all vying for customers with a similar feature set. And given that there tends to be little romance surrounding these units - they're typically small black boxes that mainstream users could easily overlook - there's real benefit in being able to stand out from the crowd. Taiwanese manufacturer Qnap is never afraid to try something a little different. Having established a sizeable portfolio of tried and trusted NAS solutions, the firm has in recent years repurposed its award-winning formula for use in atypical scenarios. The silent, living-room friendly HS-251+ was a good example, and so is the TBS-453A NASbook that's under the microscope today. 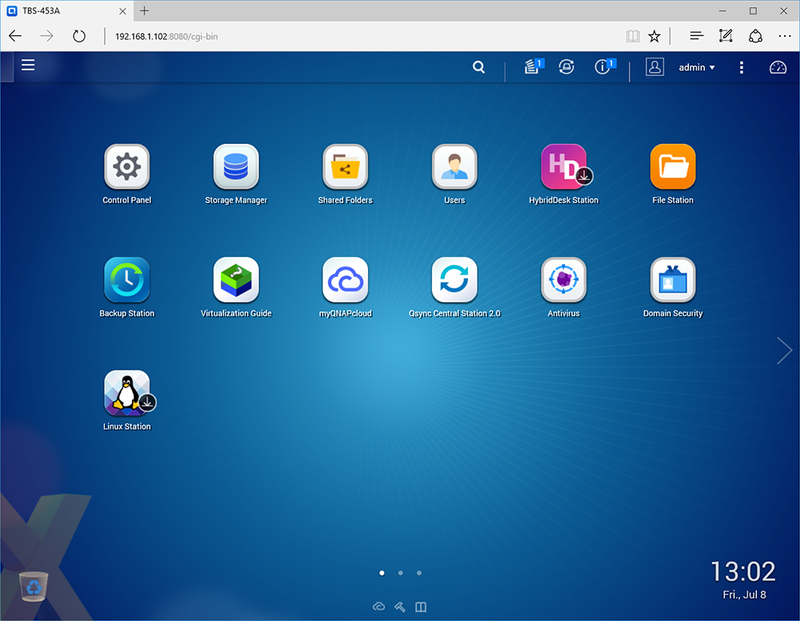 What is the Qnap NASbook? Priced from £380 in a diskless configuration, this new addition to Qnap's lineup is unlike any NAS we've seen to date. For starters, it doesn't support even a single 3.5in hard disk, and whereas most other NAS units are designed to remain in situ, the TBS-453A is marketed as portable and "ideal for office meetings." As such, the device measures just 25mm x 230mm x 165mm in size and tips the scales at a fraction under 750g. How do you go about making a four-bay NAS so small and light? The answer, using readily available technology, is quite simple: forego compatibility with low-cost hard disks and instead provide a quartet of connectors for high-speed M.2 SSDs. Flash-based media has plenty of benefits - faster performance, a smaller footprint and no noise being chief among them - yet there are obvious caveats. M.2 SSDs aren't cheap, capacities pale in comparison to 3.5in hard disks, and the use of solid state drives in NAS appliances will reignite the everlasting SSD vs. HDD reliability debate. It's fun to see Qnap presenting a unique offering given the sea of hard-disk-based NAS units already out there, and the implementation of M.2 storage bays isn't all that's new. Head over to the back of the unit and you'll find an integrated hardware switch allowing for shared network access whether or not the TBS-453A is powered up. Catering for more specialised scenarios, virtual switch functionality also allows for an isolated LAN environment - handy if you're looking to secure, say, a set of IP cameras. Browsing the rest of the TBS-453A exterior reveals plenty of other useful features. The front of the unit is home to two USB 3.0 ports (one of which supports one-touch copy), an SD card slot and volume up and down buttons alongside the backlit power button. There's a single USB 2.0 port on the right alongside a good-sized vent, and around back the four-port switch is joined by a pair of HDMI outputs, a further two USB 3.0 ports, a trio of audio jacks, Gigabit Ethernet and a connector for the bundled external power supply. An eclectic feature set, and if there's an immediate criticism, it's that the potential benefits of a portable NASbook aren't exactly clear cut. Qnap suggests that "business meeting attendees could benefit from the network accessibility to access files stored on the TBS-453A or to search for information online during the meeting." Perhaps so, but this is an expensive, albeit feature-rich, means of sharing files in an office meeting. The good news is that portability and an integrated hardware switch don't come at the expense of performance. Given the size of the device, you might have expected to find an ultra-low-power ARM-based processor beneath the hood. That isn't the case as Qnap has equipped the TBS-453A with a quad-core 1.6GHz Intel Celeron N3150 processor. The chip is joined by 4GB of DDR3 memory in the entry-level specification, while the alternative TBS-453A-8G is outfitted with 8GB of DDR3 in a dual-channel configuration. Do note that the latter attracts a £120 premium, making it more cost effective to buy the 4GB unit and manually add more memory. Getting access to the innards is easy enough - the process involves undoing just four screws - and removing the bottom panel reveals quick access to the two SO-DIMM slots, four numbered M.2 slots and a single fan that's tasked with cooling the entire system. Each M.2 slot enjoys the bandwidth of a SATA 6Gbps interface, and seemingly aware of the fact that current-generation SSDs have been known to throttle, Qnap uses thermistors to keep tabs on each drive's operating temperature. Our review sample has been equipped with dual 256GB Transcend MTS800 SSDs in a RAID 1 configuration for testing purposes, and both are outfitted with small attachable heatsinks - four of these are included as part of the bundle. Qnap's bundle is practically identical to a desktop NAS and includes a mains power cable, a small 65W external power supply, two Ethernet cables (category 5E), four heatsinks and a small battery powered infrared remote control. When considering optional extras, it's worth noting that the five-bay UX-500P or eight-bay UX-800P can be added for hard-disk-based storage expansion, though doing so would diminish the NASbook's portability. While it isn't immediately clear where the TBS-453A is best suited, there isn't a shortage of options. 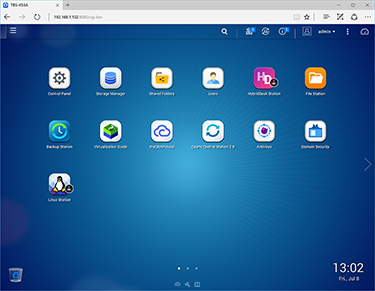 Take, for example, the dual HDMI outputs, which in unison with Qnap's Virtualisation Station app allow for the NAS to function as a PC running an operating system of your choice. In this scenario, the HDMI outputs can be configured in duplicated or extended configurations, and of course there are a wide range of multimedia apps available for direct-to-TV playback. These include Kodi, Plex and Spotify, to name but a few. Having such a diverse array of functions should, in theory, lead to a complex product, yet the majority of the NASbook's party tricks are presented in a neat and orderly way via the highly regarded QTS operating system. Initial setup is as simple as following an on-screen wizard, and even NAS newcomers should have the TBS-453A up and running in under 15 minutes. Once configured, QTS is in our estimation one of the best NAS interfaces available. It's easy on the eye, responsive, and by adopting a Windows-like taskbar, reasonably adept at multi-tasking. 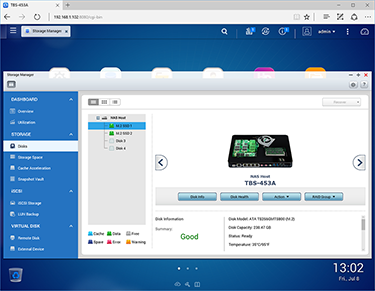 Qnap's feature list is about as exhaustive as they come and the best way to get a feel for the operating system is to try out the free live demo available at qnap.com. The question that's weighing on our minds is whether or not an SSD-based NAS can have a meaningful impact on performance. One would assume the Gigabit Ethernet will serve as a bottleneck, so let's take a look at some benchmarks.